This impressive appetizer couldn't be easier. Start with refrigerated crescent dinner rolls and stuff with cream cheese sprinkled with flavorful dill weed! Preheat oven to 350°F. Unroll dough on lightly greased baking sheet; press seams together to form 12x4-inch rectangle. Sprinkle cream cheese with dill; lightly press dill into cream cheese. 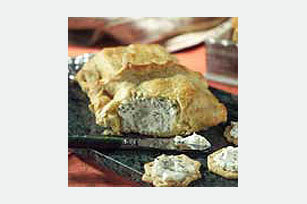 Place cream cheese, dill side up, in center of dough. Bring dough up over cream cheese to completely enclose cream cheese; press edges together to seal. Brush with egg white. Bake 15 to 18 min. or until lightly browned. Serve with your favorite crackers, French bread slices or cut-up fresh fruit. Select a few of your favorite appetizers rather than sampling one of each to save room for your entree. Substitute combined 1/2 tsp. dried rosemary leaves, crushed, and 1/2 tsp. paprika for the dill weed. Substitute 1 pkg. (8 oz.) ATHENOS Traditional Feta Cheese for the cream cheese.